I finally did it. I purchased my very own sewing machine! More on it later as I get it out of the box and learn how to turn it on. In the meantime I ordered a bunch of fabric and I have been busy planning away my projects. 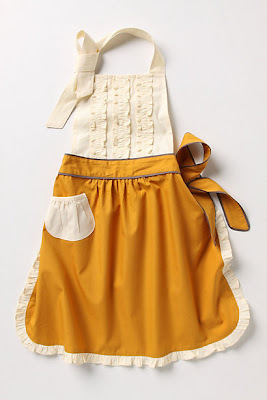 To kick it off, I really want to make an apron. I cook every day, but still do not have one. So, I high and low and came up with my top 7 inspirations for creating my very own apron. Some of these sites even have tutorials to make it easier for the novice seamstress like me! 2.Flirty Apron Tutorial from Dating Divas – This looks like a great one for a beginner like me. Kristen gives a great, full blown tutorial with pictures to show exactly how it is made.